and surveying the blue-green algae bloom! The once unbounded Lake Okeechobee has been completely contained by the Herbert Hoover Dike since 1930’s except for one remaining free flowing tributary on the west side called Fisheating Creek. This gap is paralleled by the dike on both sides for several miles, effectively creating a conduit or spillway in the process. Today this is called the Fisheating Creek WMA. The river itself is the second largest natural source of water for Lake Okeechobee (after the recently “restored” Kissimmee River), and supplies about 9% of the water flowing in! Much of the creek and surrounding lands had been in the private hands of the Lykes family for many decades. Even though on private land, the creek was enjoyed and loved by generations of local residents until the late 1980’s when Lykes restricted and closed off access. This sparked a series of lawsuits which established that the creek was indeed a navigable waterway and finally an agreement was reached which resulted in the creation of the wildlife management area. However, controversy continues almost up to the present, although public access is now assured! 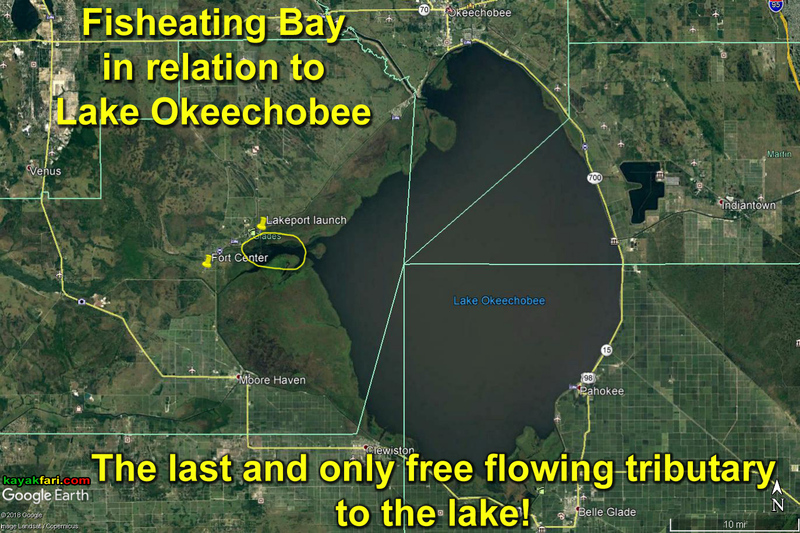 This story took place in the circled area along Fisheating Bay and Creek on the west side of Lake Okeechobee. Most visitors to Fisheating Creek paddle on the segment west of Hwy 27 in Palmdale, Florida, at the well known Fisheating Creek Outpost – a licensed concessionaire to the WMA. It’s a beautiful place, well worth many repeat visits for canoeing, swimming, camping and hiking. The best time for paddling this section is in the fall when the water levels are at their highest! The rest of the year, you can hike and camp along the creek. Check out this account of a 3 day, 36 mile through-hike of the area in the dry season with the Happy Hoofers, a local chapter of the Florida Trail Association. 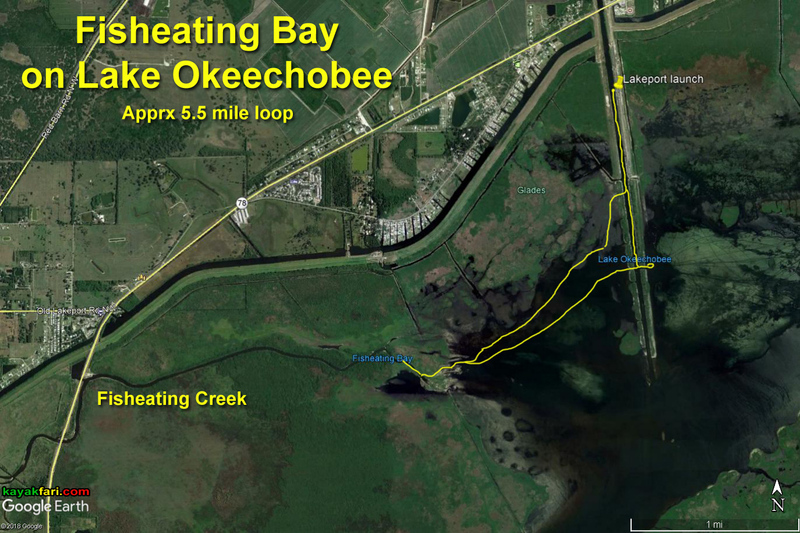 Satellite view of Fisheating Creek as it empties into Fisheating Bay and Lake Okeechobee. Note direct boat ramp access point on Hwy 78! On this trip, we would see the creek from the other side – as it flows out into Fisheating Bay and Lake Okeechobee. The lake itself has been in the news all summer due to an unusually large blue-green algae bloom that at one point covered more than 90% of the surface! The incredible growth is not the first time this has happened and surely will not be the last. It’s a direct result of excess nutrients in the water, namely phosphorus laden water. The fertilizer rich water makes vegetation grow abundantly, including the algae. Although there are many sources of pollution draining into the lake, a large percentage of the phosphorus laden water comes off the huge agricultural sugarcane fields to the south when it’s back-pumped into the lake. See – “Phosphorus Loading by Land Use – What FDEP Isn’t Telling Us!” Gary Goforth, PhD. By the end of June almost the entire lake was covered! Lake Okeechobee algae bloom spread during the summer of 2018 – satellite imagery. Although the algae has since shrunk significantly, it continues to be a problem for the lake and all down stream freshwater bodies on both sides of Florida’s coast. Near the end of August, the conditions appeared good for paddling, although it is difficult to find real time data on the algal blooms. It’s one of those “you won’t really know what it looks like until you get there” kinda things! Sawgrass, Water Hyacinth and Water Lettuce! Aerial photo shared on faceBook at the beginning of the summer of 2016 shows significant algal growth over Lake Okeechobee. The summer of 2018 was even worse with more than 90% of the lake covered at one point! The image above is from several thousand feet in the air. The image below is from the seat of my kayak, yet the patterns look exactly the same! We joked about whether or not it might glow in the dark?! I love how nature creates patterns that scale perfectly up or down! Choreographer Dale Andree paddles into the tall grass on Lake Okeechobee. The lake shoreline is buffered with lots of vegetation! This area is very quiet and serene! The beautiful flowers of the non-native Water Hyacinth (Eichhornia crassipes) on Lake Okeechobee. Filmmaker Claudio Marcotulli paddles around sawgrass and reeds on Lake Okeechobee. Paddling on Fisheating Creek – from the other side! Entering Fisheating Creek on the west side of Lake Okeechobee. Filmmaker Claudio Marcotulli deploying his aerial drone from the kayak. Drone camera hovering just above the kayak on Lake Okeechobee. Claudio piloting his drone on Fisheating Creek. Aerial drone camera eye in the sky. CLICK for the drone video footage! Watch some of the drone video footage shot by filmmaker Claudio Marcotulli. Another type of aerial photography on Lake Okeechobee, this time from the kayak and my 18 foot pole! Low altitude aerial view over Fisheating Bay on Lake Okeechobee. Selfie in my kayak from 20 feet up over Fisheating Creek. Sawgrass and Water Lettuce line the banks of Fisheating Bay. The predominant plants on Fisheating Bay are Sawgrass, Water Hyacinth and Water Lettuce! Water Lettuce (Pistia stratiotes) forms large floating mats on the surface and is a common sight on freshwater lakes throughout Florida. Water Hyacinth flowers intermingle with Water Lettuce and Sawgrass along the bank of Fisheating Creek. Engaging in tranquility on Lake Okeechobee! Most of the shoreline vegetation shown grows in overabundance and is “planta non grata“. Although on Fisheating Bay it makes for a beautiful sight! Heading back east out into Lake Okeechobee. The canal and levee provide recreation on the lake for boaters and picnickers alike! Paddling back up the canal in Lakeport we again encountered the blue-green algae (cyanobacteria). These small “guide” boulders reminded me a bit of Stonehenge. Packing it up before the afternoon storm hits! The public launch ramp on Hwy 78 directly into Fisheating Creek and Bay on the east side of the road. Fisheating Creek with storms in the distance. There is a public boat ramp on the east side of Hwy 78 directly into Fisheating Creek. It’s only a couple of miles to the lake from there! On the west side of Hwy 78 is the majority of the creek as it flows through forests, fields, pastures and the Fisheating Creek WMA. Fisheating Creek flows out into Fisheating Bay on the western side of Lake Okeechobee. It is the sole remaining free flowing tributary to the lake! 3 day, 36 mile through-hike of Fisheating Creek in the dry season with the Happy Hoofers! Fisheating Creek snakes through a dry landscape just before emptying out into Lake Ockeechobee to the east! In the dry season the creek can get very skinny. Fisheating Creek is the last free flowing tributary to Lake Okeechobee, seen here in the dry season! 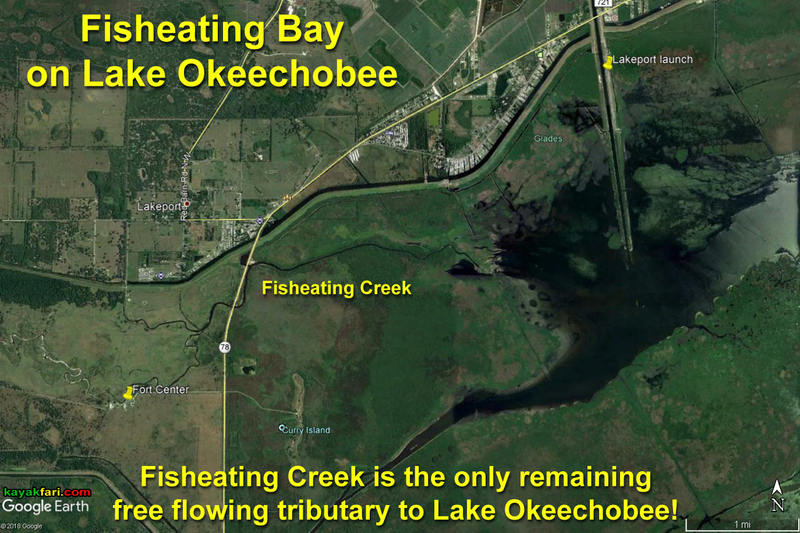 Just to the west of Lake Okeechobee is it’s only remaining free flowing tributary – Fisheating Creek! CLICK for: Hiking the Fisheating Creek WMA in the dry season! Lakeport is in a rural area that seems worlds apart from the hustle and bustle of South Florida. The drive up is a refreshing change of pace and I love to see all the open spaces presented! Since I grew up in a small town, I always feel a connection even if in a different part of the world. Rural life is much the same, no matter where you are! Lakeport, Florida is a small community on the shores of Lake Okeechobee. Afternoon thunderstorm over Lake Okeechobee behind the grassy moat that is the Hoover Dike! Better to be driving than paddling through a squall or storm!